Mephisto Walking Shoes - The Rolls Royce of Shoes! 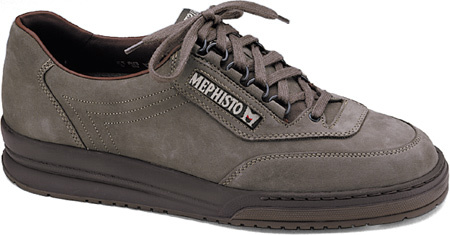 Why do we recommend Mephisto Walking Shoes - a French shoe maker that's not that well known? A company that's been hand making exceptional shoes for over 40 years? A shoe that can only be described as a Rolls Royce of shoes? Simply because we appreciate superior quality and comfort in shoes. When you've worn the best, well .... you understand we're sure! 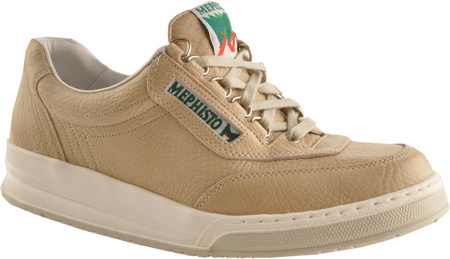 (Women's Classic Mephisto Rush illustrated). And just so we're clear this is NOT a walking shoe for everyone. Why? Because they're so darn 'muy caro' as we say in Ecuador. 'Very Expensive'! Here's our little story about Mephisto. Geoff's first exposure to Mephisto had nothing to do with fitness walking at all. It had everything to do with trying to stop foot pain when he walked. After his knee surgery (see About Us for details) his unnatural gait caused a bone protrusion on the back of one heel. All his shoes rubbed on it and caused a whole lot of pain. Between his foot pain and dealing with the rehab from surgery, walking was not an enjoyable experience at all. So - it was Mephisto to the rescue! It turns out that Mephisto was the only shoe that's so well made it could withstand having a 'bulge' stretched into the back of the heel area without wrecking the shoe. (Men's Mephisto Match illustrated). The heel area was put under extreme pressure in a special stretcher for two full days to create a slight bowing out of the heel area. Not even a teeny problem with the shoe when this was done. It worked out very well and now, even 10 years later, the shoes basically still look like they just came out of the box. The shoe still does not rub on the bone protrusion. The only thing that has worn out has been the shoe laces! As you can imagine, shoes that you likely haven't heard much about are not always the easiest to find. You wont find them in 'big box' stores, discount stores or 'volume' stores. You're going to have to seek out the specialty stores - most likely located in the upscale shopping areas of major cities. If you're like us and enjoy the convenience of online shopping just click here. Perhaps it's time for you to have at least one pair of 'Rolls Royce' shoes in your closet? (or at the very least just sneak a peak to say you saw them!). Have a look at Mephisto Walking Shoes. They're pretty amazing and yes they last a very long time! Note: Mephisto also sells a brand called the "Allrounder". Note that these are a lighter weight, lifestyle type of shoe and introduced at a lower cost. We have no information on how well or how poorly this line performs.